A quick round of snooping around the net and I found a new deck to my pleasing, well not an actual deck yet, it's still in the fund-raising stage at Kickstarter.com ... so fingers crossed it meets it's goals and materializes after some time into my always needy collector-claws. 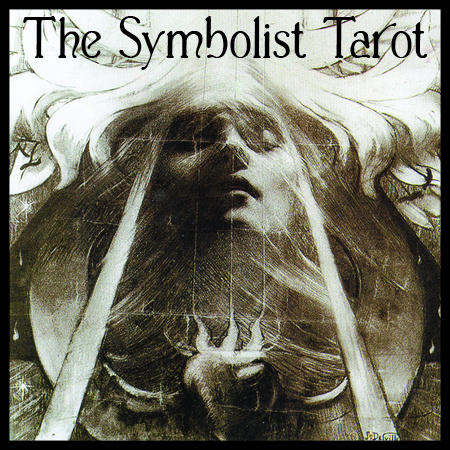 The theme of the deck is masterpieces from the Symbolism Art movement a deck that will echo and interest many readers and collectors, I know, I've heard the longing for such a deck for many years on many and various tarot forums around the world.And from what I saw from the artist's Blog and Facebookpage the artist knows the subject matter at heart and has a very warm and passionate relation with it, what results in choices I do love and understand! Alexander Daniloff an in Russia born and raised artist who since 2000 lives in Rovigo (Italy) has produced a very nice high art tarot series that where exhibited in 2010, and that wonderful work of art has found it's way to my collection, 2 times even. On the occasion of an exhibition in Russia the 22 tarocchi where printed in a small edition in card-size format (9,5x15 cm) on thick pearled cardstock, not entire satisfied with the result Daniloff has made them now available in A4 format printed on normal thickness clear pearly paper with creates a stunning effect, I have both versions and even if the small format looks very nice the larger one brings out the details and presents the art in the most flattering way. The prints can be ordered directly from the artist through his website, expensive yes, but it's worth every cent and even more! The 78 cards version is ready to be printed (well actually 81 cards. 78 cards with 3 cards added: carte blanche and two variants of the numbering Arcane Force and Justice (VIII and XI). Limited-editionS , printed in 450 copies of each, numbered and signed. Cards are printed on paper of 350 grams and are covered with a protective varnish. Card size: 73 х 141 mm.